Using a traffic light for anger management is a simple and effective strategy for teaching children to identify and cope with angry emotions. Because children as young as three or four years of age are able to understand the basic concept of a traffic light and are familiar with the use of traffic lights on roadways, they are valuable tools for use at home and school when teaching anger management skills. You can use a symbolic traffic light in two ways when teaching children to cope with anger. While children of all ages can benefit from both techniques, the emotional maturity of the children involved should be a consideration when choosing which method to include in your anger management course. When teaching anger management to younger children, a traffic light is effective at encouraging the identification of angry emotions. The color red represents stopping, and is useful when children begin to lose control of their emotions. Yellow offers children an opportunity to think and find an appropriate solution to their problem, and green lets them know they can move forward in a responsible way.Just as a driver who runs a traffic light risks getting a ticket or causing an accident, a child risks punishment, personal injury, or inflicting injury on someone else by running an anger traffic light. 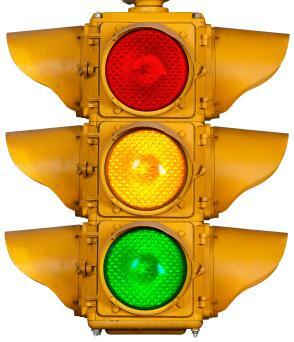 Traffic lights are useful analogies when teaching anger management to older children. Using a traffic light for anger management helps children become more aware of their angry emotions and learn to control their reactions to triggers in the environment. The three colors on a traffic light can represent the three stages of emotion a child passes through when becoming angry. Green represents calm and relaxation, or the state before anger begins to develop. Yellow symbolizes the build-up of angry emotion that typically occurs when the child first encounters a stressor. Red represents the child's reaction to the angry emotions. Once the children learn to recognize what stage of anger they are in, they can utilize coping strategies learned in anger management programs to stop the progression of their emotions before they reach red. Dealing with anger can be difficult for anyone of any age, but it is especially hard for young children. Anger is a complicated and overwhelming emotion, but using a traffic light for anger management allows children to visualize their anger and the steps necessary for controlling their reaction to angry emotions. You can purchase small traffic lights at most novelty stores and at online retailers like Amazon. You can also create traffic lights using construction paper, or print out traffic light worksheets for use by children in a classroom or anger management group.